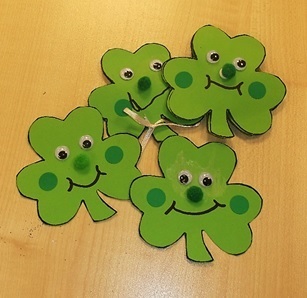 At our regular story and craft session we made these cute shamrock faces to celebrate St Patrick’s Day. 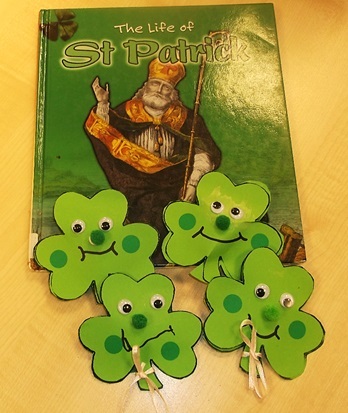 We started with a template of a shamrock printed onto green paper and drew on a face and added googly eyes. Next we put a small amount of tissue paper and then stuck on the other side of the shamrock to make it puffy and finally tied a piece of ribbon around the stalk. Hope you all had a great St Patrick’s Day! Our next Story & Craft will be on Saturday 8 April. Our old friends Canela Fina! delivered yet another great event for Brompton library with their chocolate event for children. We had a full house with everyone champing at the bit to get to the eating part of the event. 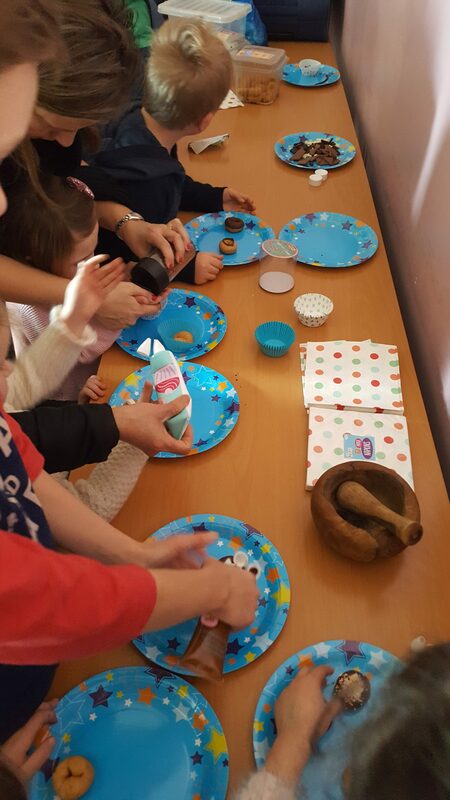 Of course, that came at the end, so before that we had a history of where chocolate came from and how it’s made, all with graphics on our screen, and then the chocolate song with hand actions that was so fast in the end no-one could keep up with it… but had great fun trying! 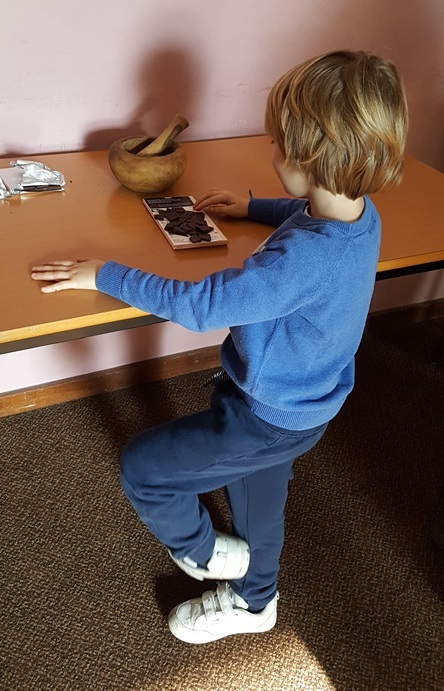 Then came the part that everyone had been waiting for – tasting the white, brown and black chocolate before drawing pictures of the Aztec god of chocolate (I hadn’t known there was one!) and then, even better, being given two little doughnuts to decorate with chocolate sauce (white and brown) and sprinkles. Well, you can’t go wrong with chocolate, can you? 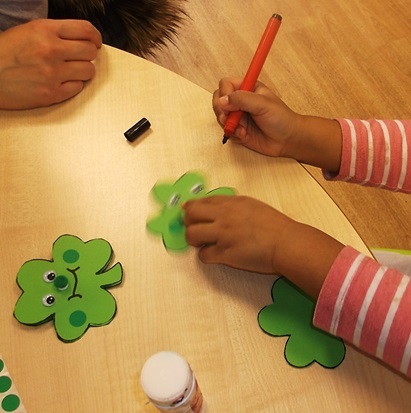 On Wednesday, 1st February and Saturday, 4th February North Kensington Library opened its doors to Harry Potter fans of all ages and invited them to take part in a series of special Harry Potter Book Night craft workshops. This event was the perfect craft for Harry Potter fans. We kicked off Harry Potter Book Night 2017 by making trunks like the one Harry uses during his stay at Hogwarts. 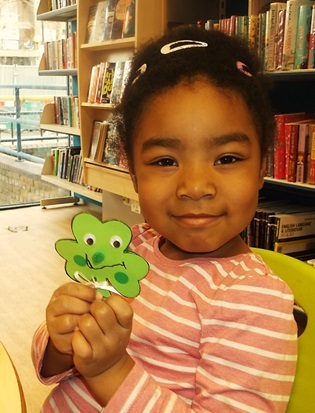 Last Saturday saw Brompton Library put this year’s Summer Reading Challenge to bed with our annual finishers’ party. The Roald Dahl theme this year was massively popular with the kids and many of them hoovered up the few titles they hadn’t already read. We supplemented his novels with joke books, revolting rhymes, biographies and autobiographies. In the end an impressive 89 children completed the challenge, and the party was well attended! They had a great time – Katie lead the party, ably assisted by our long-standing friend and volunteer Lisa and they were treated to some great games and free juice and nibbles to keep them going as they played some very energetic games such as Duck, Goose (new to me) and musical chairs and statues (old favourites). They also reviewed the books they’d read and enjoyed and talked about the craft events they’d come to at the library. Katie got some great feedback after the party and the kids and their parents agreed that the party was a great idea to round off the summer. Well done to everyone who took part and roll on the Summer Reading Challenge 2017- I wonder what it will be? Party time at Chelsea Library! I can’t believe that our wonderful providers of Spanish storytelling and dance events, Canela Fina!, have only been around for one year! Many of you will know of them from the bi-lingual children’s events they put on for us during school holidays (including this week! ), mixing stories, dance, movement and music and teaching the non-Spanish speakers a few words and phrases as they go. As organisers of their events in Kensington and Chelsea, Sandeep and I were invited to share this milestone with them in a chartered pod on the London Eye and what a great experience it was! Although the weather wasn’t really conducive we enjoyed the food and refreshments (canapes and wine!) but mostly we got to meet other people that they work with and had a long chat with Maria about her plans for the future and other events she could provide for adults as well as children. Canela Fina! have come a long way since their first session with us, always creating a new programme for each series of events and I like to think we’ve helped and encouraged them along the way. Their next programme this half term is Storytelling- Los 3 cerditos y Caperucita Roja (the Three Little Pigs and Little Red Riding Hood). Here’s to their next year! For more half term events please see our children’s events page. 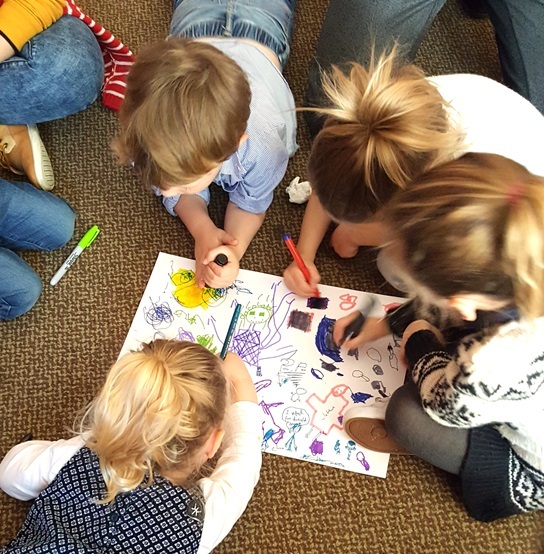 Take a look at our minibeast visit! With many thanks to Holland Park Ecology Centre team,Trevor Bowyer and Hannah Williams. To keep updated about our events and activities in the libraries, follow us on Twitter, find us on Facebook or look at our website. What a treat! 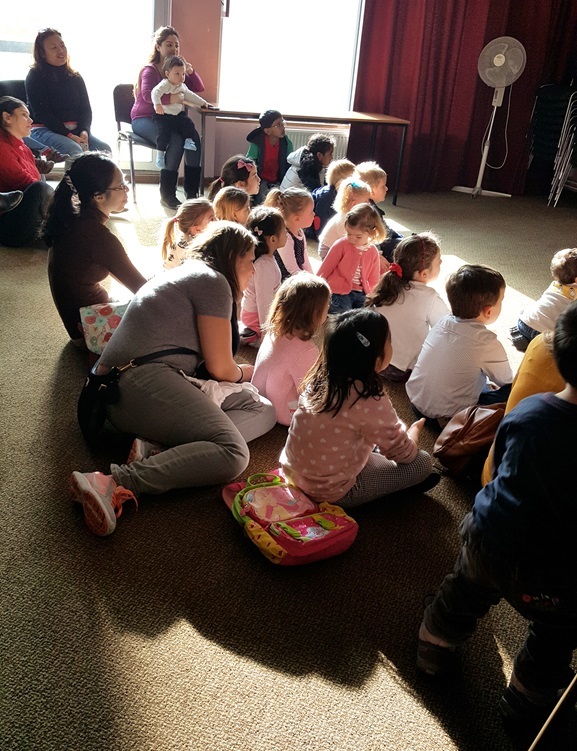 A quick post with some nice photos of our North Kensington Library audience enjoying this interactive storytelling session, The Little Paper Boat, and learning some Spanish words with Jose Maestre, teacher. Jose will have more sessions like this one in various libraries. We’re looking forward to seeing him again!